A few days off from work and being at a loose end I took myself off to Slovakia for three days train chasing. Last time it was cold and wet, this time it was hot (30C plus) and mainly sunny. Starting from Bratislava I headed first for Zvolen then Kosice and returned to Bratislava via Poprad and Zvolen. The ZSSK - Železničná spoločnosť Slovensko - the state railway company reminds me of BR about 30 years ago. This is both a good and bad thing. Good, from a railfan's point of view, in that almost everything is loco hauled. Apart from some modern Stadler railcars ZSSK owns few modern DMUs, only two axle railbuses. And in the EMU stakes they have the elderly class 460s or the new double decker class 671s. Everything else has a locomotive up front! But in the words of the late Sir Peter Parker what is self evident is the 'crumbling edge of quality'. Local trains are often in a pretty deplorable state, grafitti is endemic and many of the stations leave a lot to be desired in terms of their attractiveness to travellers. Even in large towns and cities the stations are often dowdy, with few of the amentities we take for granted today. But Slovakia is a poor country (by European standards) and it is difficult to see where the money will come from to change things. 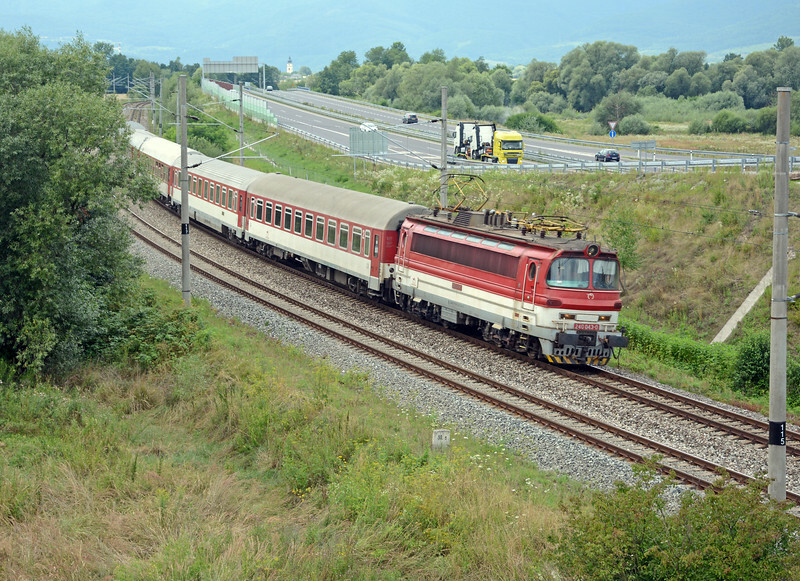 ZSSK are going to feel the heat of competition from next year if Czech open access operators Leo Express and Regiojet launch their competitive services on the Bratislava - Trencin - Zilina - Poprad - Kosice corridor. Without tilting trains it is difficult to see how anyone can run any faster than ZSSK's four daily intercity services, which with a limited load (six cars) cover the 445 kms in five hours and four minutes with six stops. I sincerely hope that widespread closures and reductions in service are not the answer to the ZSSK's problems, that the Slovak Government finds a way of releasing funds to upgrade the system whilst keeping it intact. As with passenger so with freight, although here ZSSK Cargo does have some competition, indeed I saw one of the private operator services whilst heading into Zvolen on Thursday evening. Compared to April Freight was not so plentiful, I put that down to the summer holidays, and what I did see was, mostly, long trains of box wagons carrying everything from timber to scrap to pig iron to coal (but not all in the same wagon).